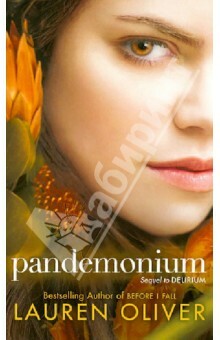 Pandemonium Harper Collins USA The old life is dead. But the old Lena is dead too. I buried her. I left her beyond a fence, behind a wall of smoke and flame. In this electrifying follow-up to her acclaimed New York Times bestseller Delirium, Lauren Oliver sets Lena on a dangerous course that hurtles through the unregulated Wilds and into the heart of a growing resistance movement. This riveting, brilliant novel crackles with the fire of fierce defiance, forbidden romance, and the sparks of a revolution about to ignite. I left her beyond a fence, behind a wall of smoke and flame. In this electrifying follow-up to her acclaimed New York Times bestseller Delirium, Lauren Oliver sets Lena on a dangerous course that hurtles through the unregulated Wilds and into the heart of a growing resistance movement. This riveting, brilliant novel crackles with the fire of fierce defiance, forbidden romance, and the sparks of a revolution about to ignite. –40 % Выгода 156 ₽ Паника 10 рец. Если вы обнаружили ошибку в описании книги "Pandemonium" (автор Lauren Oliver), пишите об этом в сообщении об ошибке. Спасибо!